The Swami Beyondananda brings enlightned comedy to the historic Nevada Theatre. The Swami will share his thoughts and take thoughtful questions from the audience. In the course of 30 years of purveying cosmic comedy and healing laughter, Swami Beyondananda has had a successful long-running monthly column – Ask The Swami – has written four books, and produced a half a dozen comedy CDs. 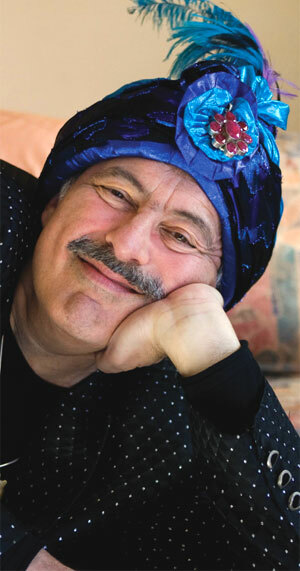 He has been on stage with the great sages of the past quarter century, and even performed for Swami Satchidananda’s 80th birthday party, along with Hollywood celebrities and international recording artists. He has gained a reputation for being both pointed and compassionate (his comedy has been called “irreverently uplifting”). Before long, Swami was the most popular feature in Pathways, as he held forth on topics such as “Everything You Always Wanted to Know About Sects” (“…unbridled sects can lead to unwanted misconceptions…”), Teach Your Dog to Heal (“…being around friendly canines generates healthy hormones called puptides…”), Tantrum Yoga (“…the latest rage on the path to ire consciousness”), and Be There Now, Swami’s ultimate take on bi-location (“…the first time I stepped outside my body, I was beside myself with excitement…”). The Swami’s articles began to appear in national publications such as the East West Journal, and publications in Philadelphia, Austin, Salt Lake City, among others. When Steve decided to pursue comedy as a full-time career in 1985, the Swami was the obvious vehicle. Shortly after his first public performance as Swami in 1985, Steve met his wife-to-be Trudy, and a year-and-a-half later, they took off in a van and trailer and launched the Swami and Trudy Show. In recent years, the Swami has performed at numerous political events, including the Transpartisan Alliance Citizens Summit, the Network of Spiritual Progressives Conference, the Department of Peace Conference, the Praxis Peace Institute Economics of Peace Conference, to name a few. Swami’s latest venture is to combine his non-religion of FUNdamentalism with the non-politics of the newly-formed Right to Laugh Party (“one big party …everyone is invited”), to create one big evolutionary up-wising to overgrow the current dysfunctional system. He will also be launching his radio podcast, Wiki Politiki in 2017, and a bi-monthly call in, Karma Talk to give folks from all over the world a chance to ask the Swami answerable questions, and receive his questionable answers.